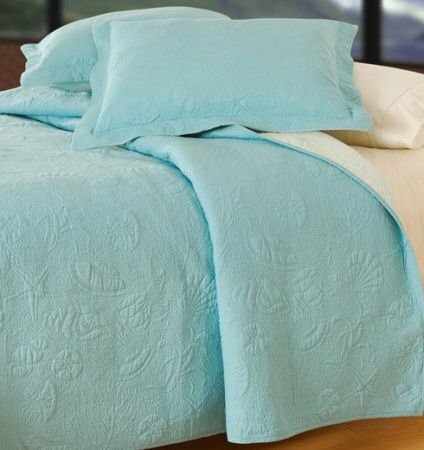 Blue Shell matelasse brings a fresh and light coastal feel to the bedroom, with its woven shells and starfish design. Available in twin, full/queen, and king quilts, standard shams, and a quilted pillow. Serene blue solid textured shell pattern. Cotton filled, prewashed, luxury oversized. 66" x 86". We offer the complete ensemble in the Blue Shell Matelasse line by C & F Enterprises. Serene blue solid textured shell pattern. Cotton filled, prewashed, luxury oversized. 90" x 92". We offer the complete ensemble in the Blue Shell Matelasse line by C & F Enterprises. Serene blue solid textured shell pattern. Cotton filled, prewashed, luxury oversized. 108" x 92". We offer the complete ensemble in the Blue Shell Matelasse line by C & F Enterprises. Serene aqua blue solid textured shell pattern. Flanged edge. 20" x 26". We offer the complete ensemble in the Blue Shell Matelasse line by C & F Enterprises.